The farmers should consider raising hot chili peppers along the edges of their farms to protect against elephants. The capsicum oil in the leaves of the plants - and the peppers themselves - irritate the elephants eyes - and can reduce the desirability of crops to the elephants. There exist special pepper-based gum-based mixtures that can be applied to farm fencing to keep elephants out of crops. Farmers in Kenya are using this approach in addition to more traditional electric fencing. On a similar note, personal protection sprays, tear gas sprays, containing capsicum oil can be used to divert elephant charges - but the spray needs a throw distance of at least 25 meters - since a charging elephant has a lot of momentum and cannot turn quickly. Some of the children's water squirt guns, like the Super Soakers, have that kind of reach - but need some extra fittings to be reliable in the field: Look at Internet listed do-it-yourself projects to improve its range. Additionally, farmers should be encouraged to invite beekeepers to keep hives at the edges of the farms closest to the wildlife preserve. Elephants can learn to avoid bee hives and bee stings quickly. The very best bet is a new one: Using elephant language to warn elephants using digital MP3 players connected to large subwoofers. For most villagers, elephant language is below the range of human hearing - so the subwoofers can be operated at high volume for extended ranges of up to 20 km. 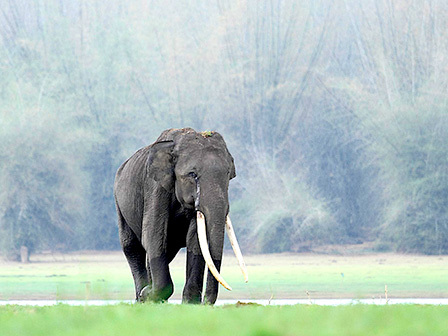 The exact elephant language phrases needed for Asian elephants can be isolated and recorded by linguistics researchers.